Japanese Urushi lacquerware products are highly regarded around the world. By featuring a SAMURAI ANIMALS™ character, this Urushi iPhone case successfully blends tradition with innovation. SAMURAI ANIMALS™ is a combination of two important elements - "12 Animals of the Zodiac" and "Samurai"- into a single concept. The Zodiac has a long tradition in Asian countries such as Japan, China, and Russia as a concept that relates each year in its 12-year cycle to an animal and its individual characteristics. People are strongly attached to a particular animal character depending on their year of birth. Thus products incorporating Zodiac animals are considered auspicious. The key message of SAMURAI ANIMALS™ is "Battle for Justice". 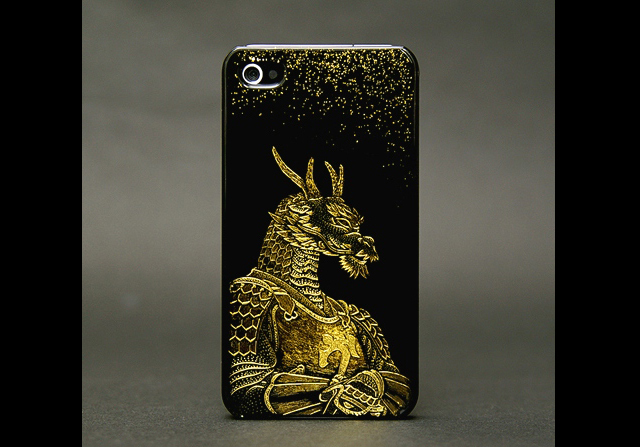 For 2012, the Year of the Dragon, this Urushi iPhone case featuring the SAMURAI ANIMALS™ Dragon presents an outstanding and stylish design as never seen before. This fine Urushi iPhone case is based on a lacquer application technique that took Atelier MITANI eight years to develop. After an initial foundation coating followed by four processes of painting and polishing the lacquer, a top coating is applied and pure silver is added to the side of the iPhone case to produce the final product. "Chinkin" is a technique for decorating lacquer ware with patterns delineated by thin lines of gold inlay. 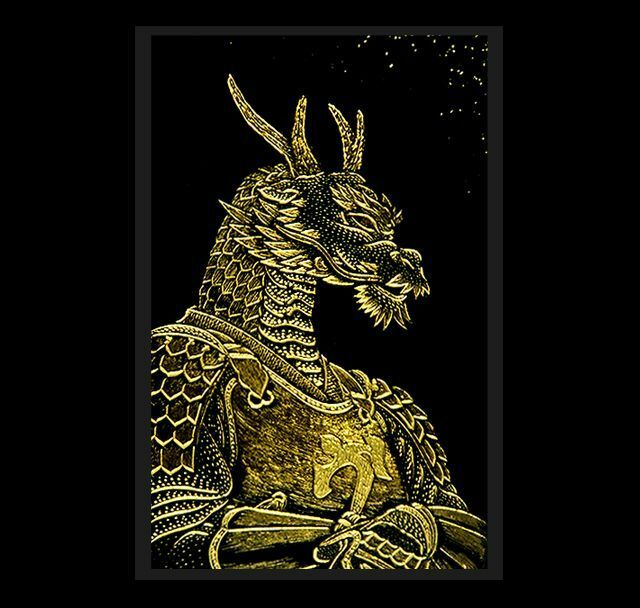 After incising intricate patterns on the surface of the polycarbonate case, the SAMURAI ANIMALS™ Dragon illustration is created by applying gold leaf and gold dust, a technique called "Makie". Moreover, this iPhone case is coated with lacquer to emphasize the outstanding design. A serial number is engraved on the back of the case. 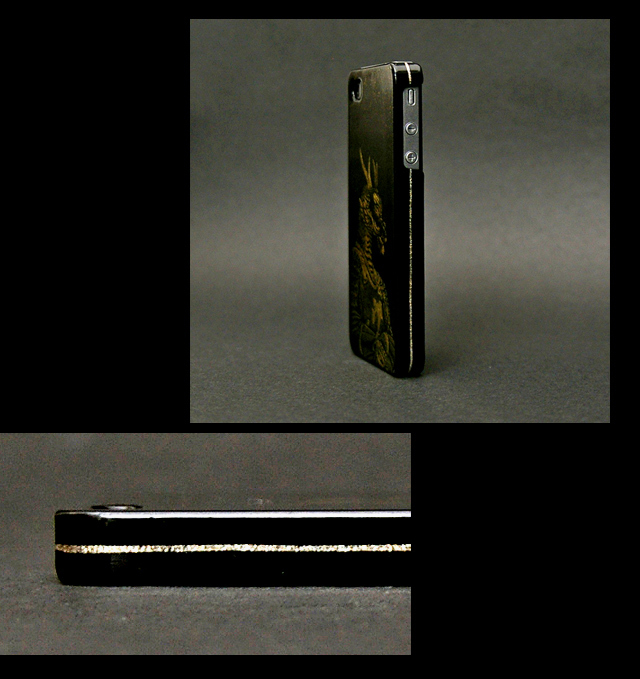 This Urushi iPhone Case has been handcrafted by skilled artisans in Japan. Every detail is well represented. For your further enjoyment, included with the Urushi iPhone Case is a complimentary DVD showing Japanese artisans devoting long hours to carefully produce every item. Material: Polycarbonate, urushi (Japanese lacquer), pure gold dust, gold leaf, and pure silver etc. (1) This iPhone case is made from polycarbonate and coated with lacquer. Please avoid rubbing against metals or hard surfaces. (2) Please wipe the surface of the iPhone case using the cleaning cloth that is provided with the product. (3) Since the SAMURAI ANIMALS™ Dragon illustration has been individually handcrafted, every item has some distinct difference. Thank you for understanding.